An English Literature graduate, Ted spent two decades at Naga DDB Malaysia where he helped win and grow over 50 accounts including DiGi Telecommunications (Telenor), BMW, Johnson & Johnson, Carlsberg, Prudential Assurance, Uniqlo, Nikon, Panasonic, Perodua Automobiles, Astro (Measat), Nippon Paint, Tourism Malaysia, Brand’s (Cerebos), Mamee Noodles, Malaysia Airlines and Hong Leong Bank. The agency was Malaysia’s most successful and consistently awarded, winning 3 Agency of the Year titles, Malaysia's first D&AD Yellow Pencil, numerous Cannes Lions, Clio Awards, One Show Pencils, AWARD Awards, AdFest Lotus, Spikes Asia and the country's only Asia-Pacific Effie. He took the job of Chief Creative Officer at Leo Burnett Singapore in 2012 where he helped the agency win the regional IKEA business and worked on Samsung, McDonald’s, UOB, Great Eastern Life Assurance and Earth Hour. 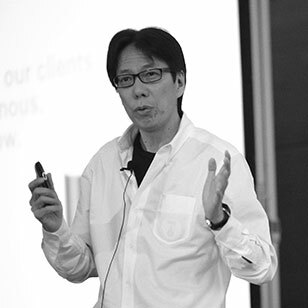 Now regional Chief Creative Officer at Dentsu Asia-Pacific, Ted works with 26 offices across 15 countries. Creative luminaries like Andy Greenaway, Merlee Jayme, Agnello Dias and Santosh Padhi joined him and helped Dentsu win a slew of new business across the region including Unilever, Nestle, Adidas, Coca-Cola, Sprite, Qantas, Toyota and Yamaha. A creative strategist, Ted believes “we are in the business formerly known as advertising” and marketing in the digital economy requires a creative strategy that is more relevant and personalized to make the human connection necessary for business transaction. He repositioned Dentsu Asia-Pacific as an “Innovative Business Solutions” provider beyond advertising that produces non-traditional work in the mobile, digital and social space. Work that is different and makes a difference, work that moves people to move business, from engagement to transaction. The work produced by his team – Adidas ‘Odds’ in India, Glenlivet “Single Belief” in Taiwan, Kobayashi ‘Air Pollution Discount’ in China, BabyLove “Premmie Proud” and Chadstone ‘Tailor Made Store’ in Australia, Singapore Airlines ‘No Detail Too Small’ and Canon ‘Instazoom’ in Singapore – won accolades at the Cannes Lions, D&AD, One Show, Clio Awards, AdFest and Spikes Asia. Dentsu was named Campaign South-east Asia Creative Agency Of The Year 2016, crowned AdFest Network Of The Year 2017 and Campaign Brief Asia’s Most Awarded/Creative Network 2017. In 2017, Ted pushed the envelope to further differentiate Dentsu Asia-Pacific from traditional advertising networks. He took the concept of a strategic support unit from Dentsu Tokyo, remodeled it into a specialized business solutions network by mothers for mothers and launched MamaLab Asia-Pacific. BBC took notice of the potential of marketing to the “mom economy” and covered the launch on World News. Ted spends an inordinate amount of time on people and product development. The staff development programs for 2017 include digital immersion with Google, Facebook, Amazon and Snapchat in Palo Alto, an Innovators Conference in Bangkok, a Young Innovators Workshop in Tokyo and Best Of Month creative reviews online. His emails to his team typically end with two words,“Keep pushing”. On top of the work he is paid to do, Ted served as Jury President at the Cannes Lions, Spikes Asia and the Asia-Pacific Advertising Festival (AdFest). He judged D&AD, Clio Awards and the APAC Effies, spoke at the World Knowledge Forum in Seoul, the P&G Asia Brand Managers College in Singapore and gave postgraduate Integrated Marketing Communications students from the Northwestern University of Chicago a presentation on Innovative Business Solutions.